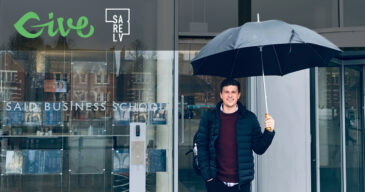 With Give and the Fee Recovery add-on, the bitter pill of payment gateway fees is made easier to swallow by asking donors to foot the bill. Credit card processing fees are often the last stumbling block between an NGO and accepting online donations. Accustomed to taking checks and cash donations, it feels like giving away money to have to pay processing fees to a payment gateway. Thankfully with Give, you can avoid giving away cash to credit card processors. Unlike some online donation platforms, Give does not charge additional fees on your donations. We make our money from the sale of premium add-ons. By lessening the impact of fees from the gateway, you are eliminating the only per-transaction fees associated with your online donations. That’s more money for your organization! The Give Fee Recovery add-on lessens the impact of fees by asking donors to give a little more than they would otherwise. This way, when the fee is collected at the gateway, your organization gets the full amount that the donor intends to donate. The following video demonstrates the setup and implementation of adding fee recovery using our Fee Recovery add-on. If you’d prefer to read, an explanation follows the video. Step 0: purchase an add-on bundle. Fee recovery is included in Plus and Pro bundles here. Alternatively, you can purchase the add-on by itself. Once you purchase the add-on, it will be downloadable from your account and the link will be emailed to you. Install and activate the add-on to get started. If you need help doing so, visit our documentation. Step 1: Configure the Global settings. 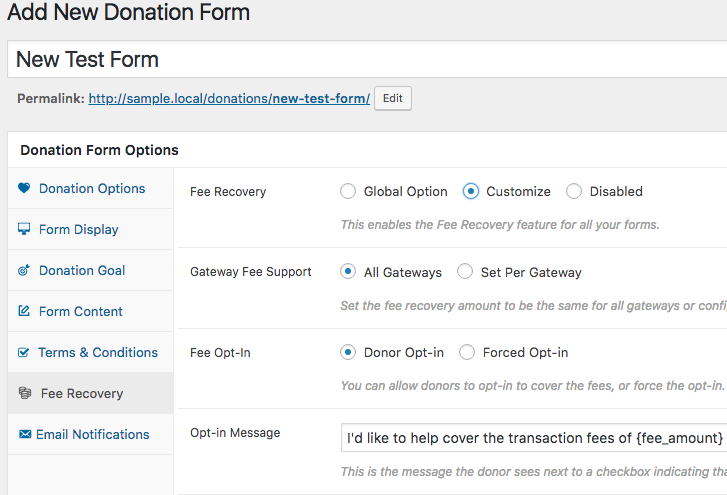 Once Fee Recovery is activated on your site, navigate to Donations > Settings > Fee Recovery (tab) to configure the global (or site-wide) settings. These settings can be overridden on individual forms, but generally apply to all forms on the site. For the purposes of this tutorial, we recommend the settings as shown in the screenshot above. For a full rundown of all the settings and options for Fee Recovery, see our documentation. Step 2: Test Fee Recovery. Once you’ve configured the options for Fee Recovery, the next step is to either create a new form or visit an existing form. With the test payment gateway active, process a new donation from an incognito browser window to see how a donor will experience the donation with fees. 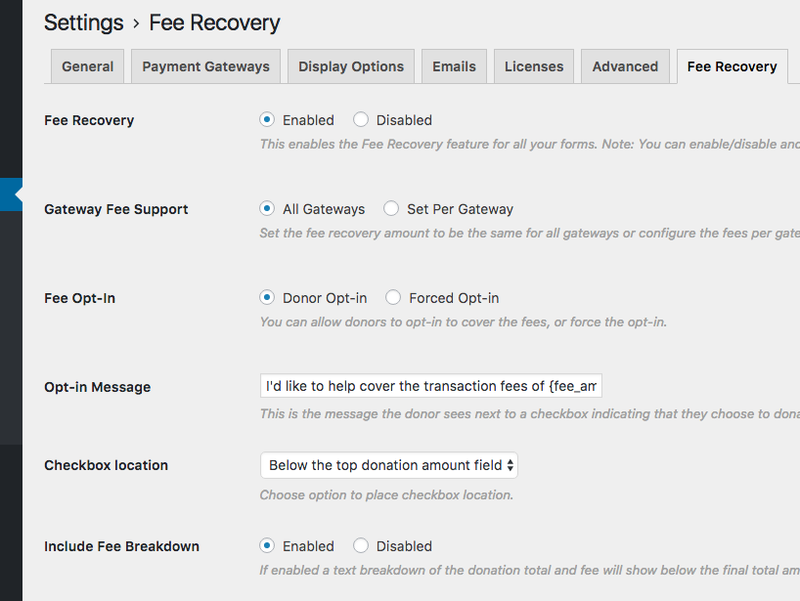 Note that the fee breakdown message toggles on and off with the Fee Recovery checkbox, to alert donors that they are adding to their donation. 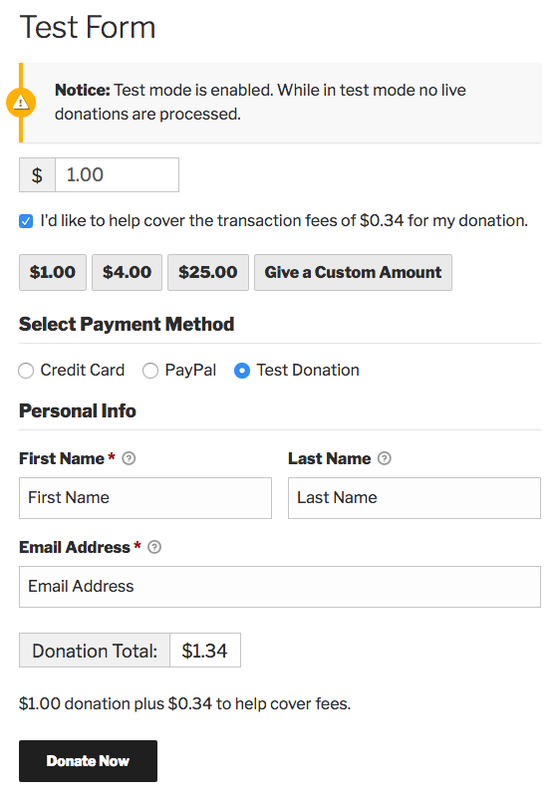 Also, if your test form is multilevel or has custom amounts enabled, the math is done right in the browser for donors to see how their fee changes in real-time. For the purposes of this tutorial, we’ll enable the Stripe payment gateway. You can learn more about using Stripe with Give in our article here. By default for accounts in the USA, Stripe currently charges 2.9% plus a flat $0.30 on each transaction. 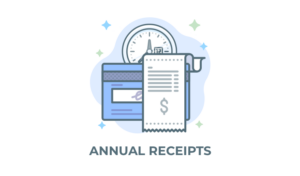 Stripe and other payment gateways offer discounted rates for tax-exempt and other types of Nonprofit accounts, so be sure to confirm the fee rate that you get from Stripe. Once Stripe is active, ensure that Test Mode is active on the site so that you can test a Stripe transaction without having to use real money. After activating Stripe and enabling it on the payment gateways settings page at Donations > Settings > Payment Gateways (tab), open the form in a new incognito browser to test things how a donor will see them. Use Stripe’s test cards (learn more about testing Stripe here) to submit a test donation. Make sure to opt to cover the fee. Then on the Stripe Dashboard, navigate to the Payments tab, toggle the dashboard into test data mode (bottom left), and select the test donation you just processed. There you can see how the math works out to make the net donation equal to the donation amount on the form after fees are removed. This is a critical piece to understand. The goal of the Fee Recovery add-on is not just to add the percentage, but to make the net donation the original amount. For more on the credit card processing fee math, see our documentation. Step 4: Configure settings per form. This will bring up a familiar interface, very similar to the Global settings you’ve already configured. These settings will only apply to this particular form. Step 5: Configure different percentages per-gateway. 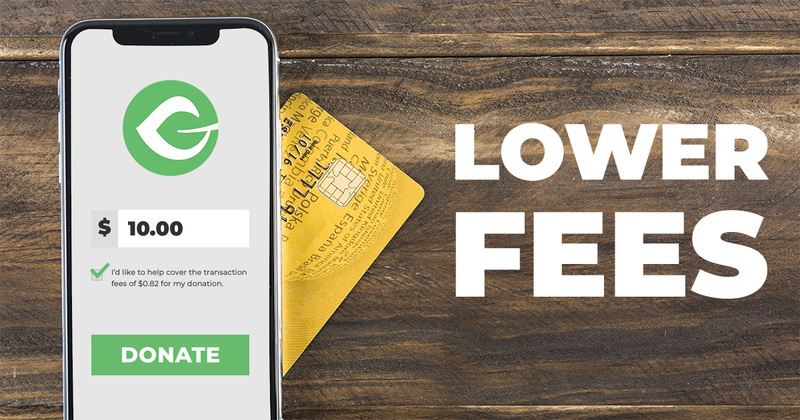 If you have multiple payment gateways active in the Give settings, there’s an option (on both the global settings as well as individual form settings) to add in different fee percentages and flat fees based on the gateway. This is a great way to configure your form to be able to account for different fee rates at each gateway. Note: Some Gateways charge a different amount based on the credit card being used. There’s not a way to configure per-card fee rates within our add-on, but you can account for the different rates by estimating how much of a fee you can expect (based on historical data) and setting that fee (with a $0.00 flat fee) in the settings. Fee Recovery is a powerful way to increase the net donations that your organization takes in. On an annual basis, we’ve seen it mean tens of thousands of dollars for customers. Donors want to help your organization and an extra few dollars to cover fees is a great way for them to show that. So get started today: Buy an add-on bundle, then install, activate, and configure Fee Recovery!